Book Report: "Goodbye, Darkness: A Memoir of the Pacific War"
Manchester delivers a Hemingway-like rumination on war, solemnly revisiting the islands he fought on while a sergeant in the Pacific during World War II. The visits stir up chilling recollections of battle scars both physical and mental, thought-provoking essays on the brotherhood, patriotism and psychological damage from warfare. 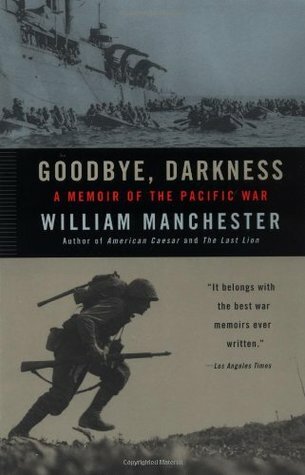 "Goodbye Darkness" is an honest, humble account meant to deglorify whitewashed legends of heroism. For every triumph, there was collateral damage of lives snuffed out and fractured on both sides. Manchester is haunted by all his wartime deeds, even his moments the textbooks would describe as glorious. He wrote the book as a way of self-healing therapy, and his work exemplifies the burden that weighs on veterans. He references battles throughout history, juxtaposing his call of duty with the plights of soldiers dating to Thermopylae and Vietnam. His book is a chilling voyage through dark, troubled memories. An eclectic, meditative puzzle adventure, "Gorogoa" feels like a playable piece of art. Georgously drawn and animated by Jason Roberts, the game burst with creativity and intrigue. Designed to look like en eclectic, illustrated instruction manual of sorts, the game -- originally released on PC earlier this year -- makes an apt pairing with the Switch. Touch screen interactivity replaces mouse pointing and clicking with aplomb. You tap spots on the pictures, enlarging the surface area you're focusing on to reveal more detail. Once you decipher the solution, you advance to the next page. As you work your way through the game, a thoughtful, if obtuse, narrative starts to develop. The methodical experience is not for twitch-happy players, but a welcome change of pace for those who like to do their gaming kicked back in a recliner while sipping on coffee. "Enter the Gungeon" was one of the biggest surprises on the indie scene last year, with the retro-styled roguelike/bullet hell mashup winning over critics and players. Once the Switch dropped, it seemed like only a matter of time until the game popped up on the Switch. In ideal fit for the Switch's handheld mode, "Enter the Gungeon" barrages you with diverse weaponry and rooms crammed with traps and bloodthirsty enemies. Loaded with unlockables, secrets and loot stashes, the adventure offers plenty of replay value, thanks to the diversity of its challenges, heroes and techniques to master. The learning curve may be steep, but once you find yourself dodge-rolling through a spike roller to shoot out a sentry, then dodge a stream of projectiles to find yourself cornered, only to reload, work yourself into space and unleash a room-clearing attack to make your way to the exit, you feel like a true badass. Until Devolver Digital hunkers down to forge a true sequel, fans should play the dev's near masterpiece on the Switch, in what may prove to be its definitive form. The Wii suffered such a deluge of third-party party games -- all trying to recapture the thunder of "Wii Sports" -- that publishers have been hesitant to pump out such games on Nintendo systems since. "Party Planet" joins a slim crowd in the genre on the Switch, with only the poorly-reviewed first-party launch title "1-2-Switch" to contend with. Most games of this ilk are mediocre by definition, but redeemed by their pick-up-and-playability. Goofy, fleeting fun is about all you can ask for, with the personalities of you and your fellow gamers called upon to add most of the entertainment value. "Party Planet" fulfills the party game parameters without taking any extra steps to go beyond what you'd expect. Most of the games in the collection require minimal timed button pushes and are light-skill challenges that track and compare scores. With few standouts and more than its share of stinkers, "Party Planet" goes for quantity over quality, managing to accomplish that meager goal. It's a reasonable pickup if your Switch library is light and you are looking for some variation to show off your system to curious non-gamers. Anyone else can skip this one and spend their time and money elsewhere. The Otterbox name is synonymous with maximum protection, but also, somewhat unfairly, as blocky, heavy and cumbersome mummifications that rob devices of their svelte shape and utility. Over the past few smartphone generations, designers have made strides to nullify that stigma. As phones became more powerful and expensive, the need to protect them only grew, so the challenge was to provide similar levels of armor against drops and elemental exposure while preserving the sexiness factor. With the latest edition of Star Wars-themed Symmetry cases, Otterbox has gotten the combination just right. Image rises above function with this string of releases, with the likes of Darth Vader, a Storm Trooper and a Rey/R2/Millennium Falcon combo gracing the backside. The phone pops into the one-piece case after a minimal wiggling and shoving, forging a tight grip with zero possibility of the device ever popping out. The case admirably protects your phone against facepalm-inducing face plants with a surrounding lip that juts out just enough to preserve the face during crashes on flat surfaces. The added bulk is barely noticeable, keeping the phone able to slide in and out of your pocket. About the only knock against the case I have is that its slick material was sometimes slippery. The sleep button is a little sluggish to the touch, but you get used to applying more force within a day or so. The slight sacrifices are more than wroth the upside of flashing Darth Vader whenever you pull out to text or post pics, as well as the peace of mind won't mean an untimely drop means the fall of the Empire. Single-player, story-based campaigns have become the norm in annual sports titles, serving as more than the glorified tutorials they were in the past to become a significant part of the package. Ubisoft's winter sports-based game "Steep," didn't include a campaign, instead opted for an expansion dubbed "Road to the Olympics" that takes you through a young upstart's quest for gold in South Korea. The long road to glory begins humbly, with qualifying runs on small courses with hardly any crowds to speak of. Professional and personal obstacles pop up along the way, but every setback is just more heartstring-tugging fodder the producers will eventually use to feature you before your medal attempt. The campaign may be the main attraction, but there is plenty more in the expansion's offing. New alpine skiing, snowboard and freestyle ski events are included, adding to the base content and previous expansion to fill out the package in impressive fashion. Since the base game that includes the expansion can be had for $60, with the expansion by itself running $30 -- you need the base game if you opt for the expansion on its own -- your options for picking up the full experience are on the inexpensive side. Luckily there is nothing cheap about the quality. Five months after releasing the impressive U11, the manufacturer followed it up with an even more impressive feat. The U11 Life manages to cram just about every relevant feature of the device into a slimmer, lighter and much cheaper package. The $349 device includes the squeeze functionality that separated its predecessor from the pack. Acting as a sort of hot key macro, a squeeze can pull up an app. While not overly useful, the squeeze provides another quick, seamless way to navigate your phone. The Snapdragon 630 chipset and 3GB of RAM keep the device running fast and smooth while juggling multitasking functions. The dual 16MP cameras produce impressive stills and video. The proprietary uSonic earbuds, included in the box, make up for many of the audio deficiencies in the cut-rate speakers. Android users hail software diversity and customization as a major draw, and the U11 Life feeds into that draw by integrating Amazon Alexa into its Google Assistant interface. If you want to order something off Amazon, pull up a Prime video or search for a song on Amazon Music Unlimited, it's far easier to do so on this advice than, say, a Galaxy. The paltry 32GB storage capacity -- an expected sacrifice to keep the cost of the device low -- is mitigated by expandable micro SD memory. That the device is resistant to both water and dust adds to its utility. Those looking for a budget, high-end smartphone can do a much worse than the U11 Life. A throwback to flip phones that fit easily into pockets along with keys and wallets, the durable, tech-savvy device is a welcome, low-cost alternative to the likes of Galaxy and Pixel competitors on the Android scene. After a bungled March 2016 release plagued by bugs and dopey design choices, developer Wolf Brew Games took the flood of negative feedback into account and quickly reworked the title from the ground up, rereleasing it less than half a year later. The result may not have been perfection, but was closer to the original vision projected in teases and interviews. Now "Slain: Back from Hell," which takes more than a few cues from "Castlevania," arrives on the Switch with reputation intact. Its 16-bit, side-scrolling sensibilities are a natural fit for the console -- especially in handheld mode -- and is all the more crucial because of how slow Nintendo has to re-implement the Virtual Console of the Wii, 3DS and Wii U that allowed gamers to rebuy classic titles. After your curmudgeonly hero is revived from death by an alarmingly pushy spirit, you're off on a platforming, sword-swiping escapades filled with swarms of creatures of the night out to stop you from vanquishing the great evil that you've been summoned to confront. Tight controls and delightfully corny 1990s-style visuals and storytelling are the main draw here. You will need to get over a resentment of overtly cheap enemies and choke points to fully enjoy yourself, but figuring out the quirks of advancing is much of the fun. On its chosen level, "Slain: Back from Hell" rarely fails to slay. The adventure game genre comeback spurred by Telltale and the horde of walking simulators has paved the way for indies to go back to the old point-and-click model and experiment in refreshing ways. That's why we get "A Hat in Time," a whimsical time-hopping point-and-click affair with action elements. Your cherubish character, equipped with a mystically powered hat, is free to roam through environments, interacting with objects at will to advance the story. The often irritating crucible of trial and error is there to bear, but the annoyance is mitigated by the loads of easter eggs waiting to reward you for actions that don't advance the story. You might find your character plop down on the couch to catch some cartoons, drop to all fours to chase a roomba or take the helm of a captain's chair for a free-wheeling spin. The writing and characters are compelling enough to keep you moving along. Expect to rely on walk-throughs to make your way through some obtuse bottlenecks, though. For both better and worse, the visuals never miss a chance to cheese out. If the methodical, point-and-click slow-roll feel of yesteryear is your speed, "A Hat in Time" is your game.